I am considering doing some future blog posts (along with the upcoming series The Male Appetite and more 70s and 80s blog posts) that include analysis of modern action films. I thought this would provide an interesting opportunity to compare and contrast the presentation of manhood in the 21st century as compared to the 20th. Before I do so, as with everything else I do, I thought I'd take a moment to ponder what modern manhood is all about. If anything, manhood in the present day is a little less restricted. There are many more opportunities and different ways to showcase manliness. Men today are seemingly more concerned with the details of their physical appearance. It isn't just about physical strength and muscles. Lean definition is important but there is, too, a focus on certain aspects of grooming. Men get manicures, pedicures, wax their eyebrows and other parts of their bodies. There's more attention paid to wardrobe. These changes are welcome to some but others see it as a disturbing trend. In the past fews years, many sociologists, political figures, writers and anyone with an opinion has commented on the changing state of masculinity. Some suggest the role of the modern man is unclear. Others have said that men are becoming obsolete. Still others talk of the rampant feminization of men. This last assertion interests me most. Are men becoming more feminine? If so, what is the cause? Is it something chemical, is it some after effect of the feminist movement, or is it evolutionary? Obviously, I won't find this answer through watching a bunch of bad modern action films, but sometimes clues can be found in art. Perhaps it is a stretch to call an action film art, but for the purposes of this post I am doing so. Many of the top 80s action stars have made their way into 21st century films, and though these men are technically senior citizens, they remain as buff and firm as ever. Then there is the 21st century action star- these men aren't necessarily locked into a permanent action hero role. Like Jake Gyllenhaal in the photo above, many get really ripped and toned for one performance and then go back to their regular bodies to play a part in a non action oriented film. I'd imagine this puts more stress on the body then just maintaining a muscular physique at all times. 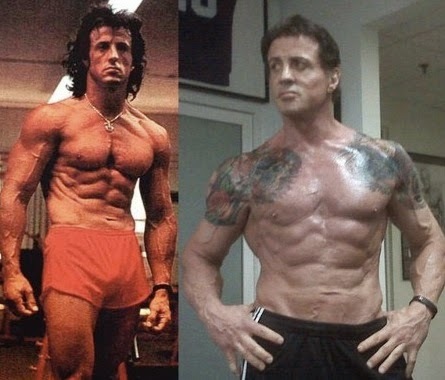 Nevertheless, in many ways, these modern actors are much less limited then a Stallone or Schwarzenegger, who played essentially the same role their entire careers. What can be made of all these changes? Do they benefit men or harm them? Do men need a specific type of masculine ideal to follow or is there power in breaking down these traditional notions? Is the modern action star any different then those of the 70s or 80s? I will try to answer these questions upon viewing some current films* and if any readers have any ideas as to the answers, comments are welcome on this topic or any other. *This will likely not become a series. I will probably get frustrated and annoyed by the modern action film and return to watching 70s and 80s stuff pretty rapidly.